In December of 2008, I began work on overhauling the Civic Federation‘s proprietary and outdated content management system. The CMS worked well, but did not allow for incorporation of social media tools, required extensive HTML programming to make any changes, and could not support blogs or other easily-updated informational databases. The new website as planned would address all those concerns and provide a firm launching pad for the organization’s online-based public policy research. 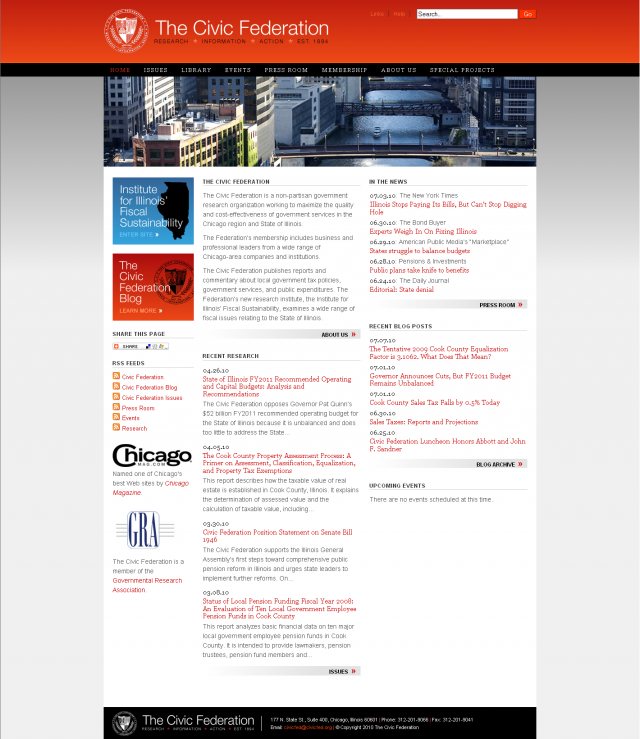 The new Drupal-based website, which was designed and programmed by Sandbox Studios of Chicago, launched on July 17, 2009. I was responsible for most of the project-management, editing, and beta-testing duties. 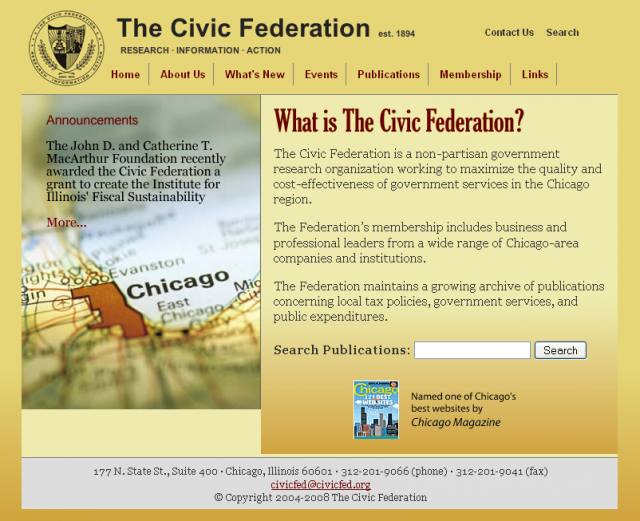 The New Civic Federation Website, Launched July 2009. The new website features two regularly-updated blogs, a library section that hosts all of the Federation’s more recent research documents, a press room that highlights media coverage of the Federation, and an “Issues” page that profiles the various aspects of the Federation’s research. While at the Civic Federation, I was responsible for developing large amounts of regular content about local and state government issues. I wrote and edited a majority of content for the Federation’s latest annual report, including the sections describing the organization’s accomplishments and publications. A distillation of recent activities of the Federation’s Illinois-oriented institute. Illinois Governor Pat Quinn ends a controversial and costly program. Recent legislation to lessen pension funding demands may backfire in the very near future. The Chicago Transit Agency expects to receive a much-needed sum of cash from the Illinois government. What does this mean for the CTA? The Civic Federation’s annual luncheon gala recognizes Chicago civic and business leaders for their accomplishments. The Civic Federation blog has provided a constant source of news and analysis about fiscal issues in Chicago and Illinois.